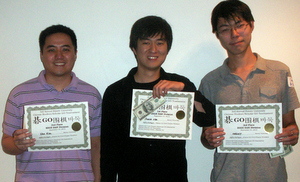 Yeong Cha (center), an extremely strong player on the TYGEM go server, showed he’s just as comfortable on a real board by winning the third annual Emory Go Tournament player on Saturday, September 21 at Emory University in Atlanta, GA. “Yeong seemed very comfortable with vague, doubtful positions but he would always convert them into a winning position,” reports Tournament Director Jeffery Kerlagon. Emory University, which hosted the tournament for the third consecutive year, “provides a great tournament game room,” said Kerlagon. “It is truly a grand facility.” Just over two dozen competitors from Georgia, Alabama and South Carolina turned out on a rainy night, and “New faces made this an exciting event,” Kerlagon added. 3rd Place – (Oasiny) Zhao ($40); DAN / KYU DIVISION: 1st Place – TIE – Rodney Keaton & Hiroshi Yamane ($40 each); 2nd Place – TIE – Darrell Speck & Adam Chesler ($25 each).